8 PM Update: And 96° it is, at 3:46 PM EDT. Temperatures were 90° or above for 8 consecutive hours beginning at noon. The low of 74° is no slouch either, just 2° below the record highest minimum for the date, if it holds through midnight. That certainly looks feasible, although temperatures will be dropping quickly. Overall, at this rate, the day is adding 12° of surplus over the long term average. 5 PM Update: The temperature was 95° for 3 consecutive hours; that's probably good enough for a high of 96°. That crashing noise around noon today in the Washington metro area was the sound of temperature forecasts busting as the mercury once again reached 90°. It rose 3 more degrees in the following hour to 93°. 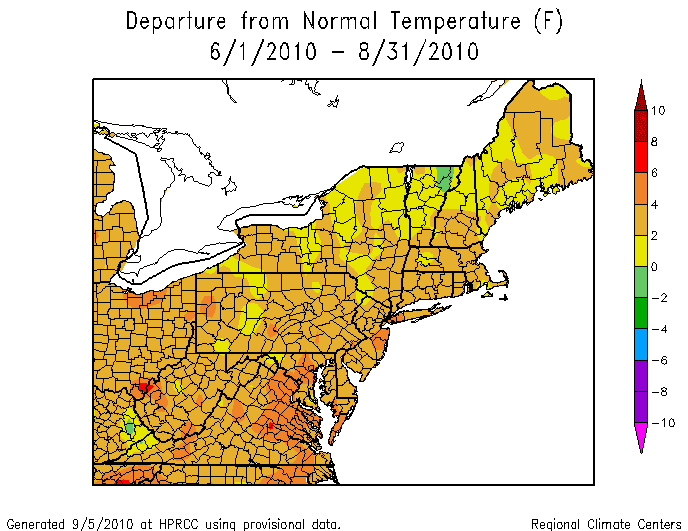 This is now the 62nd day of 90°+ temperatures in 2010. 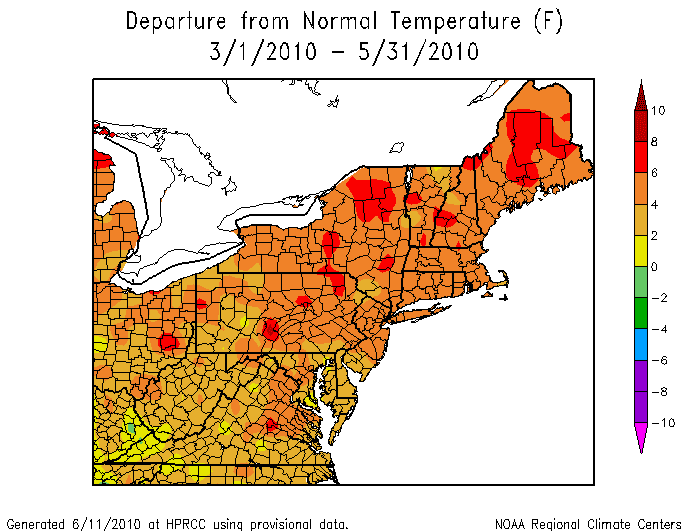 Although that is still 5 days ahead of the torrid pace toward 67 days in the record-setting year of 1980, temperatures will drop to more seasonable levels for at least the rest of the week, and 2010 may, for the first time all year, drop behind the record pace. 5:30 PM Update: The preliminary high/low temperatures for Sept. 7 are 94/69. If the low holds through midnight, the first week of September will average nearly 6° above the long-term mean. At 3 pm today, the temperature at Washington National jumped 4° in an hour, reaching 93°. 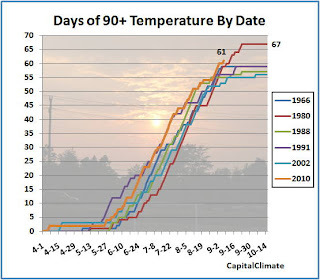 Following a record hot spring and summer, this is the 61st day of 90°+ temperatures at Washington in 2010. The record for one year is 67 in 1980. The total didn't reach 61 in 1980 until 5 days later, however. Temperatures at other major regional reporting locations were also 90° or above; 91° at Washington Dulles and 90° at Baltimore/BWI. 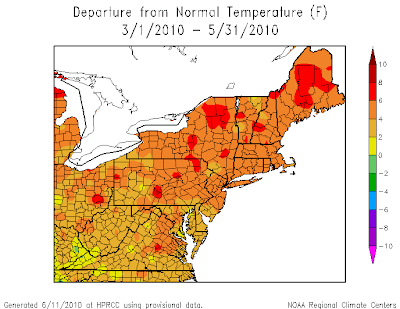 Two other stations (Charleston WV and Erie PA) had their 3rd hottest spring-summer, Pittsburgh PA had its 6th hottest, and Huntington WV had its 7th hottest. Baltimore MD: Hottest summer, average 79.3° vs. 79.1° in 1943. Roanoke VA: Hottest summer, average 78.2° vs. 77.4° in 1987. Danville VA: Hottest summer, average 80.0° vs. 78.7° in 1952. Blacksburg VA: Hottest summer, average 72.9° vs. 72.3° in 1987. 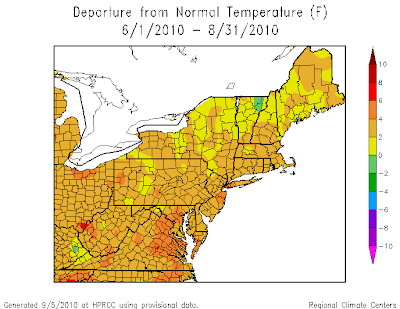 Bluefield WV: Hottest summer, average 74.5° vs. 74.2° in 2007. Raleigh NC: Hottest summer, average 81.7° vs. 79.8° in 2007. Most June-August 90°+ days, 67 vs. 58 in 2007 and 1992. Greensboro NC: Hottest summer, average 80.1° vs. 78.5° in 2007 and 1993. Most June-August 90°+ days, 52 vs. 50 in 1993. Asheville NC: Hottest summer, average 75.4° vs. 75.1° in 1952. Charlotte NC: Second hottest summer, average 81.1° vs. 81.5° in 1993. Greenville-Spartanburg SC: Hottest summer, average 81.0° vs. 80.2° in 1952. 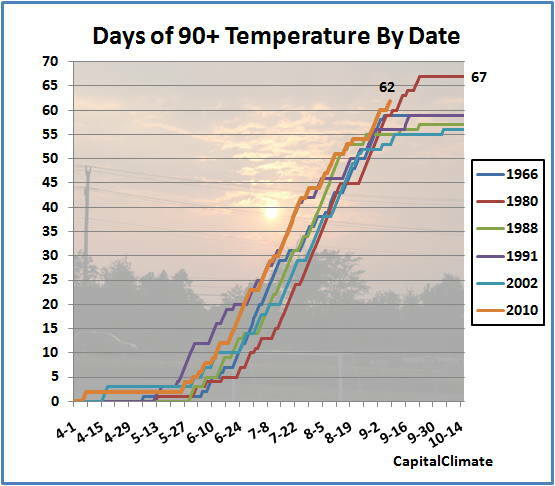 Savannah GA: Second longest string of 90°+ temperatures, 40 ending Aug. 14, vs. 44 ending Aug. 8, 1993. Chattanooga TN: Second hottest summer, average 84.0° vs. 85.7° in 2007.